MIGHT IN FACT BE TOO TIME CONSUMING FOR ANYONE WHO WANTS OUTSIDE LIFE. SERIOUSLY. 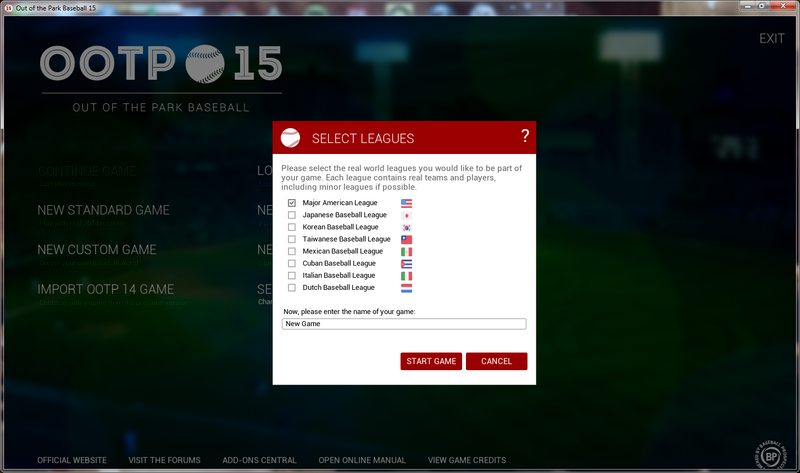 From the very get-go, one gets the sense that Out of the Park Baseball 15 is going to be an immersive experience. 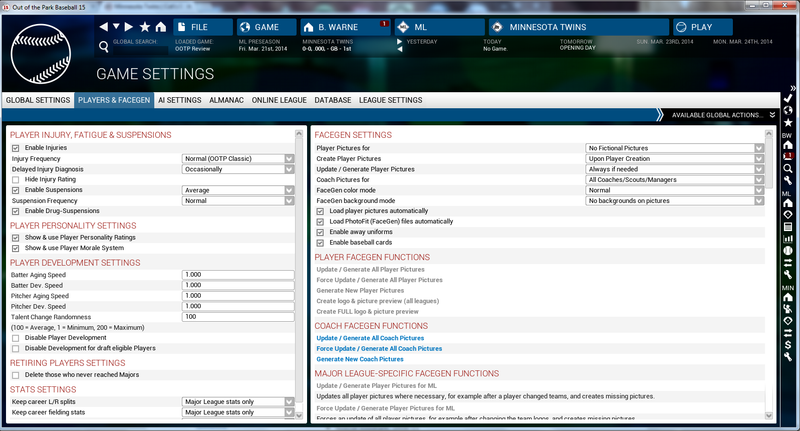 Just by virtue of selecting “new standard game” — one of eight different first screen options — the user is confronted with the decision whether to take the more standard path with a new league based on 2014 MLB rosters and schedules, or whether to choose between seven other national leagues from all across the world. At that point, you get to choose whether you’d like to be commish (all powerful), GM (just like MLB), or can’t be fired, for which the game quips “some Yankees managers of the past would have liked this option!” Humor is evident in all facets of the game, giving it good character for what’s ultimately a text-based game. 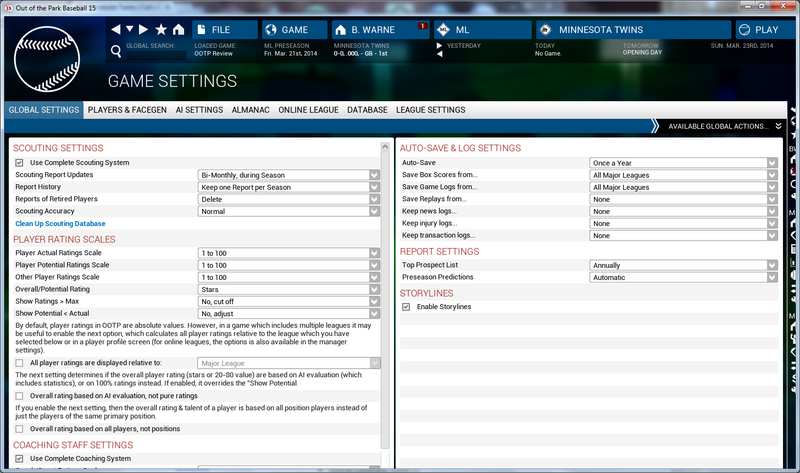 Taking a more customized route is also an option, as users can choose to create a historical season from any year spanning from 1871 to 2013, with each era being given a special distinction, and each year getting a couple paragraphs of a summary (such as 1987 being the year the Twins defeated the Cardinals in the World Series, and George Bell won the AL MVP). Other options include real world and fictional leagues, which can be tailored to the player’s liking in pretty much every way one could conceive. 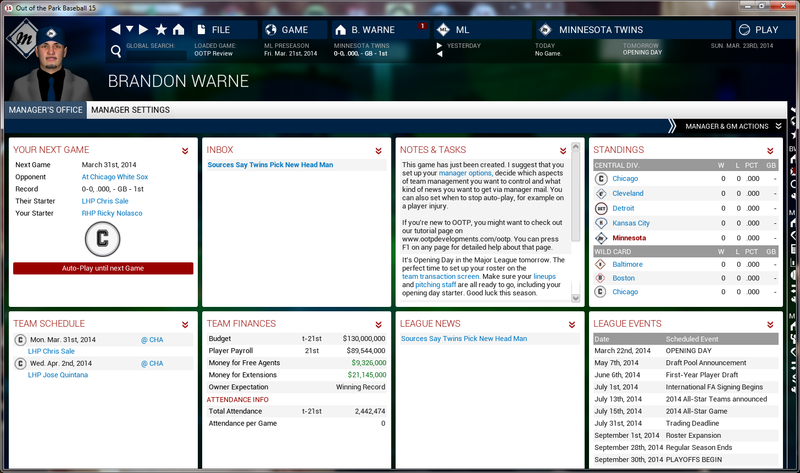 The next level tweaking that can be done includes minor league, financial, and special historic options such as era-specific strategies. Upon selecting a team, the player is directed to the front page, from where all business is to be conducted. From here, the general manager can read email, browse finances, view upcoming schedule and standings, and be just a click away from doing lineups, transactions, and of course, tweaking settings to their liking. The global search feature is also useful, as a player page or function can be found much more quickly. This year’s game felt as though the menus moved more quickly as well, and were considerably less clunky. 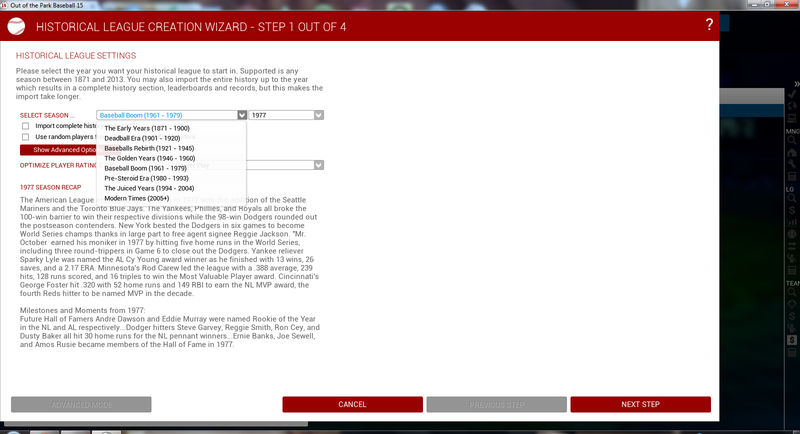 I, for instance, prefer the 1-100 rating scale, and that’s only because it was how I cut my teeth as an OOTP 6.5 player. The default on the game is 1-20, but there’s also the 20-80 scale which mirrors that which pro scouts use to grade players both in the present, and when they try to gauge that player’s future. Want to create your very own steroid era? You can do that by inflating hitting sliders. Want a sabermetrically friendly team which rarely, if ever, bunts or steals? Again, customizable from your team page. The possibilities are indeed endless. 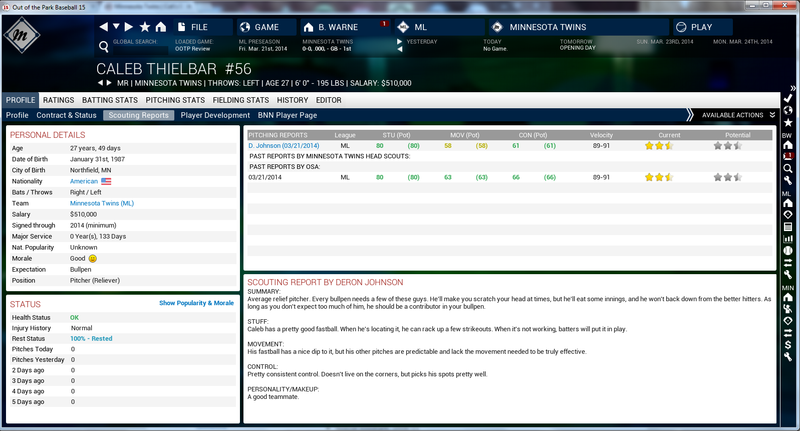 The player pages are so incredibly in depth, you’d think they came from Inside Edge; that’s the company who provides scouting reports to big league clubs. A quick glance across the Twins yields some very accurate results. Here, left-handed reliever Caleb Thielbar is pegged as a decent middle reliever. Brian Dozier is regarded as a pretty good hitting and fielding second baseman. 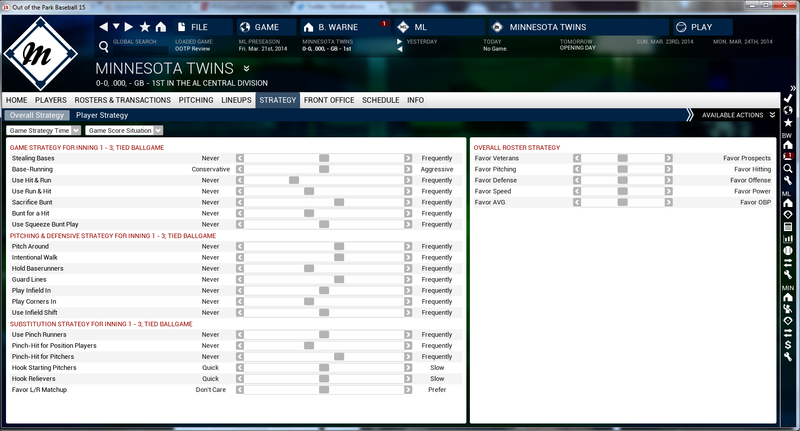 Joe Mauer has a very high contact and discipline rating. Byron Buxton has off the charts potential. Some of the ratings seem to be a bit muted at first glance, but it appears as though that’s across the game, perhaps in an effort to make the gap between good players and stars worth noting. That’s something other sports games — console or otherwise — have struggled with in the path, as when scores gravitate towards the upper echelon, there’s no differentiation between superstars and regular players. OOTP seems to have a pretty good grasp of this. 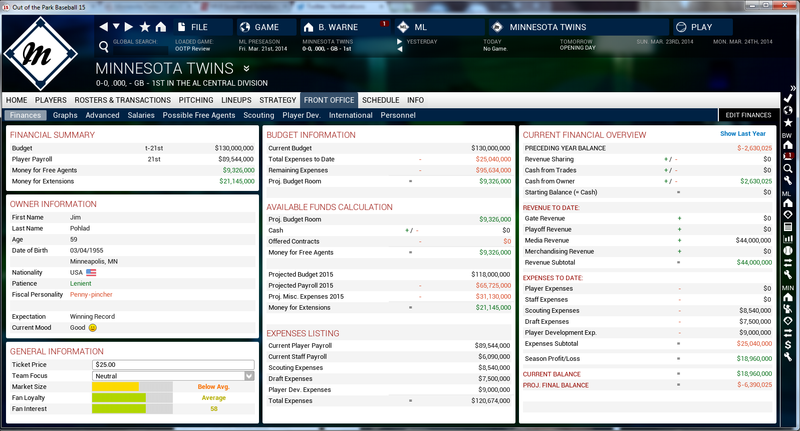 The finances page is extremely detailed, boiling down to even expenses like player development and draft in addition to the usual suspects, such as player and staff payroll. The projected budget room helps so you can see if you can add a player for that late-season run, or if you may have to sell off to stay solvent. As far as the Twins go, the game lists Jim Pohlad as a ‘lenient penny-pincher.’ As odd as it sounds, that’s pretty close to the public perception of Mr. Pohlad. Here’s the lineup card for Opening Day, complete with season stats, perhaps relevant splits, and all the settings you will want to determine if you want to go pitch-by-pitch, or just sort of skim through the game. Once you’re done and click “start game!” you’re greeted by fan noise that’s strangely reminiscent of what an on-field mic might pick up at a real baseball game. That noise isn’t all you’ll hear, as you can also hear chatter from the stands, and the umpires calls as he makes them. It’s a neat added touch. 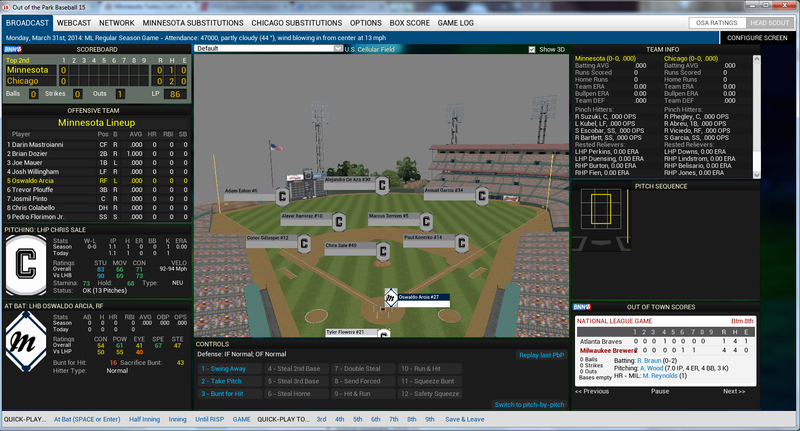 The new 3D field design looks neat, even if it’s just a standard field and not U.S. Cellular. That’ll probably come in future iterations of the game, as it’s believed the OOTP community will come up with some of these graphics per the OOTP press release. 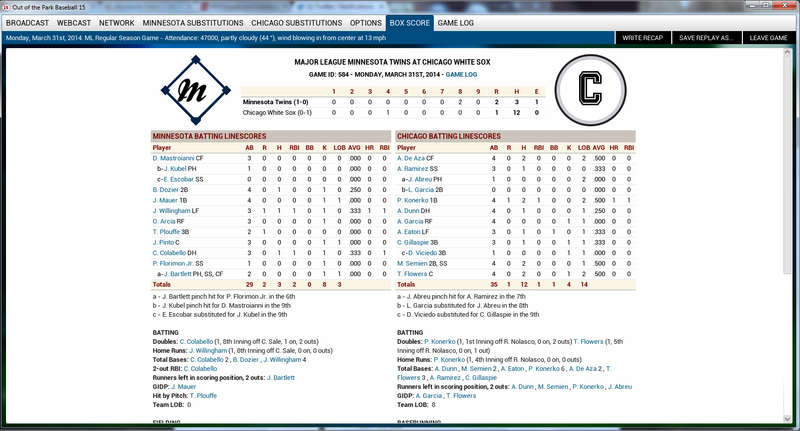 As one can see, the page is rife with data that can all be pertinent at different times for a player. 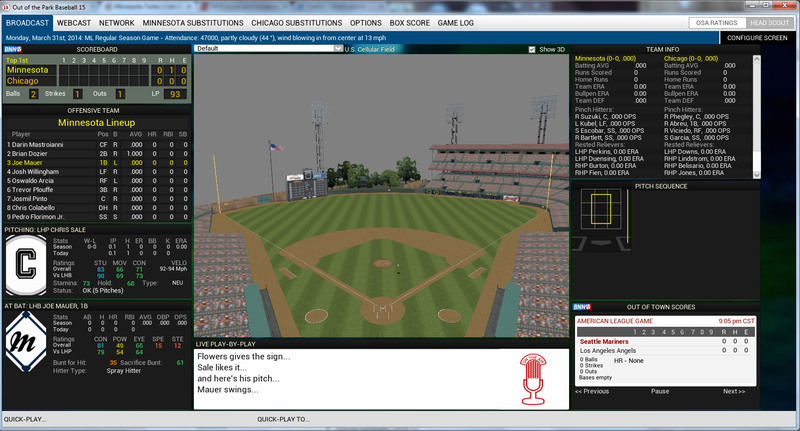 This screen, in fact, is the ‘ball in play’ screen, which is a new feature that shows the trajectory of a batted ball. Word from the parent company is that this feature is a work in progress, so look for patches to come out for it as the weeks pass by. Here, Joe Mauer grounds out to Marcus Semien playing second base for the Pale Hose. This screen is the between pitches screen, with multiple options given at the beginning of each plate appearance. Selecting ‘swing away’ sets up the plate appearance to play through, while opting to ‘take a pitch’ is an option until one is at two strikes. All the other menus will activate when prudent, such as ‘steal second’ with a runner on first, and so on. The out of town scoreboard on the bottom right is a nice touch. Another nice touch is the view of the opponent’s bench and bullpen. It’s almost like being a manager, with the opposing lineup card at your fingertips to maximize your moves late in the game. 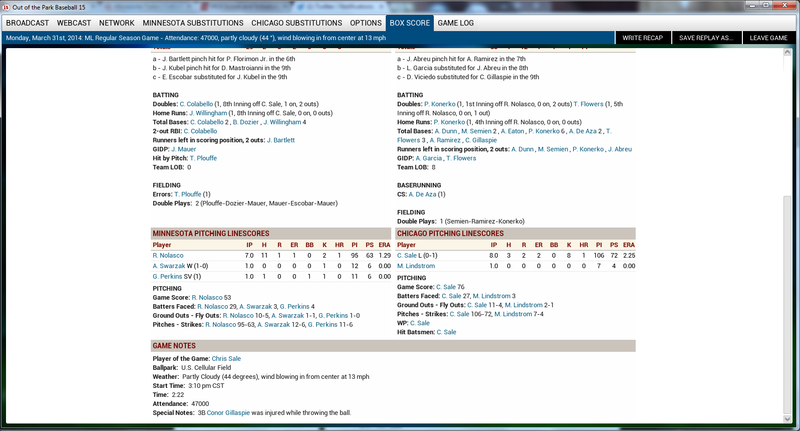 The postgame box score is exactly like one would get in postgame notes from a big league club, complete with time of game, attendance, weather data, and special notes. Here’s a quick peek at the free agent board. 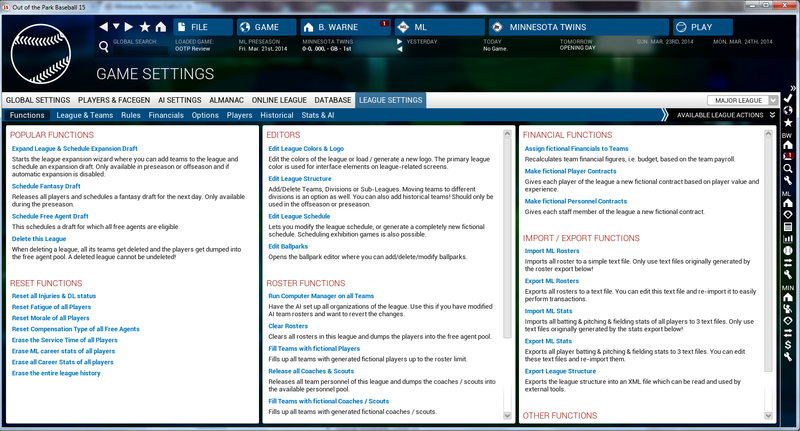 All these menus are sortable, and now have a list of players’ demands to get them signed. But you have to make sure they fit under your budget, which is very, very accurate in the Twins’ case. Cot’s Contracts — a Baseball Prospectus joint — lists the Twins Opening Day payroll at just a shade over $85.5 million, while the game lists it at about $89.5. I’d consider that close enough. The 40-man roster stood at 35 when booting the game up, with an equal mix of guys added to the 40 after spring training and removed from it still on. But as far as roster accuracy goes, that’s still far better than most games. Aha! We have our first trade proposal right out of the chute. Last year’s game was plagued a bit by some odd trade proposals — Hiroyuki Nakajima for Glen Perkins and Byron Buxton, anyone? — but Nyjer Morgan for Eric Fryer at least makes *some* sense. Across the league, a pair of deals were made in the first week, as the Rays traded Logan Forsythe to the Jays for Adam Lind (not terrible, I suppose), and the Giants traded Pablo Sandoval to the Yankees for Brett Gardner. Again, not terrible, but I’m not sure the Giants do that deal. But reasonable deals, or a lack thereof, are something which still plague even the latest console games. This seems to be a step in the right direction. Another fun function is the ability to simulate a day in ‘real time’. If for some reason you want to simulate a game to take as long as a regular game — or a league day to take that long, for that matter — you can. You also have the option of speeding it up 300 fold (where it says ‘factor 300’ up above), where a full day takes about five minutes. Nearly halfway through the season is the draft. It’s a lot like last year’s game, with in-depth scouting that can be done within the last month or so prior to actually selecting players. 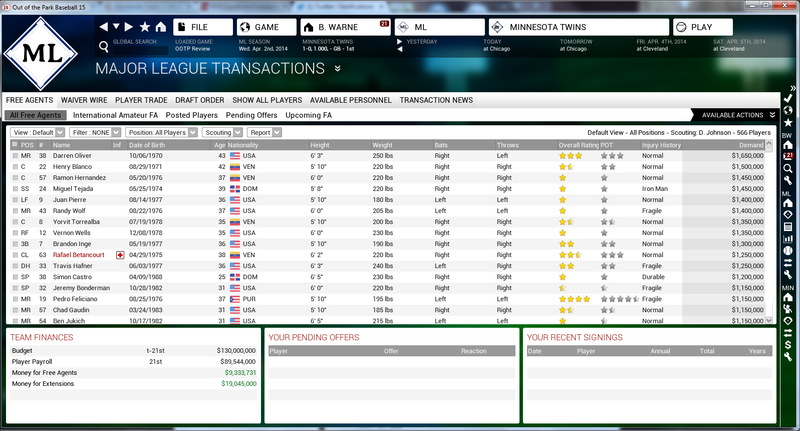 Now, the game lists a guy’s bonus demands and the likelihood that a player and team can come to an agreement. 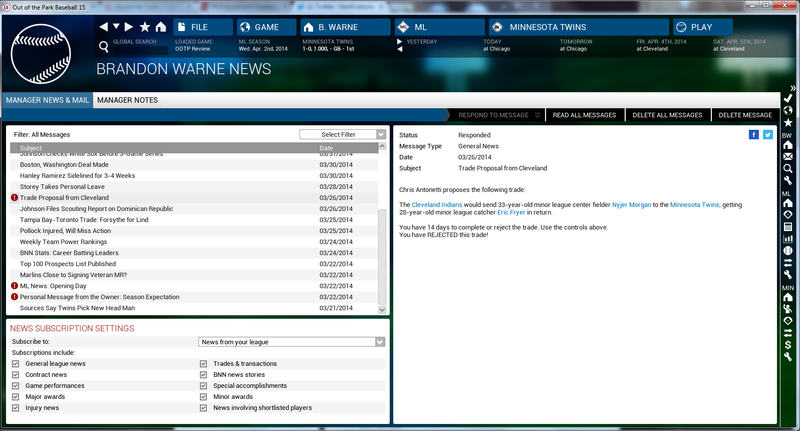 As expected, OOTP goes above and beyond here with a very realistic experience. The rest of the season plays out a lot like last year’s game, with the All Star Game, trade deadline, and roster expansions all coming before the playoffs, the Fall Classic, and the chance to start all over again with a new season. 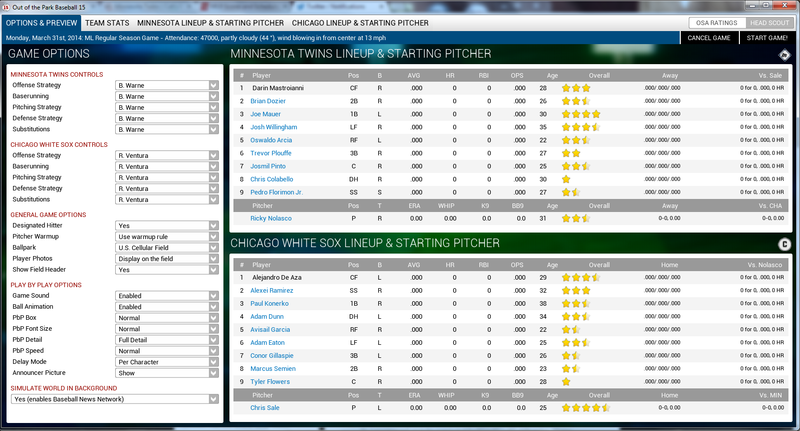 OOTP 15 somehow found a way to take the best game of the year last year (non-console division) and improve upon it. If there’s a next step for next year’s game, I sure don’t know what it is. 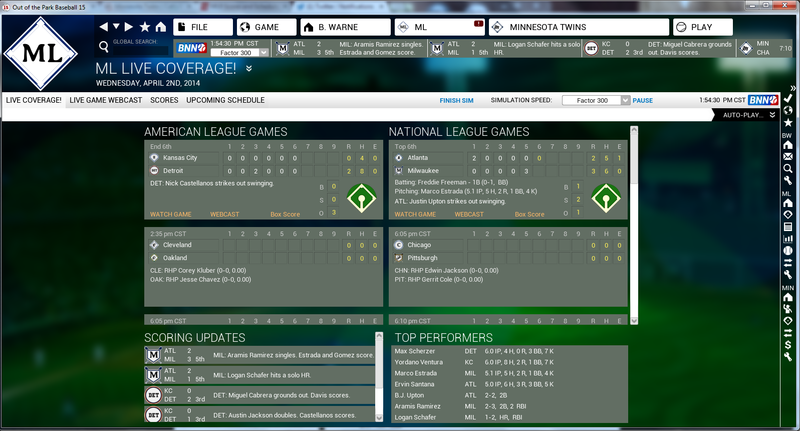 All-encompassing for a simulation game. Console games can’t dream of this kind of detail.